Brett McClure enters his second season as assistant coach at Stanford. He worked for four seasons as an assistant coach at the U.S. Air Force Academy. 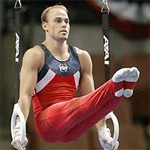 Before coaching, McClure was a world-class gymnast, competing for the U.S. men’s national team for seven seasons. As an athlete, McClure earned a silver medal at the 2004 Olympic Games as member of the United States team. It was the highest finish for the Americans at the Olympics in 20 years. McClure earned national titles in the pommel horse in both 2001 and 2004 and competed in six U.S. Championships where he earned a total of 12 medals. Internationally, McClure competed in over 20 competitions, highlighted by the Olympic Games. In addition, he competed in three World Championships, twice helping the United States to silver medals. McClure retired from completive competition in 2006 to concentrate on coaching. After four seasons with Air Force, he will bring his expertise to The Farm with the intention of helping the Cardinal bring back the national title in 2011.